It’s time for another flavour now though, and this time, I’m paying attention to Maple Nut Brittle. And, may I just say …. Who Are Sugar Pie Vapes? 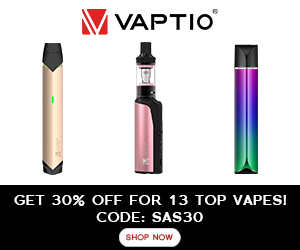 You can save 10% on ALL items at TABLites using my exclusive discount code > BESTECIG, including Sugar Pie Vapes juices! Get all 5 SugarPieVapes flavours in 10 ml bottles for £15.49 including shipping. Just this link & my exclusive TABLites discount code: BESTECIG. It’ll give you 10% off your entire order! If you want to buy these, head on over to TABLites. If you use my exclusive discount code: BESTECIG you’ll even save 10% on everything on the site. Tasty treats and a nice little discount too. I’m loving life today. I’ve never had maple nut brittle before, but I know what nut brittle tastes like, and I also know what maple syrup tastes like. I lived in Canada for two years so I virtually drank gallons of the stuff. I will never forget my first pancake and maple syrup breakfast … With bacon. I wasn’t sure on the bacon, but I still have a little-unopened glass bottle of maple syrup here that I saved from my Canada days. I’m saving it for a special occasion. The smell is a bit … odd. I’m not sure that I could smell maple syrup at all in it, and it was only when I looked at the little list of flavour ingredients on the side that I realised what I COULD smell. It was strawberry. Yes, that’s right, it’s got a bit of strawberry in it. I don’t know why. Why is this? Does maple syrup have strawberry in it? The exact flavours listed, are strawberry (at the top), peanut, maple, suraclose, and ‘others’. Why is strawberry at the top? Isn’t the top one meant to be the one with the highest quantity? Why is strawberry right up there? That doesn’t make sense to me, but battle on I shall. I used Sugar Pie Vape Maple Nut Brittle in my brand new Innokin Scion tank (that was very kindly sent to me by the wonderful peeps over at ecigclick), on top of my Wismec Predator 228. I’m pretty sure the Predator is going to be the new favourite I talk about for months now. Sorry in advance. In fact, I’m not sorry at all. I love it. The 0.5 ohm coil fired up at 80 watts beautifully. And yes, I finally got over my scary 60 watt barrier. I couldn’t seem to go above it on any of the tanks I owned, until the Innokin Scion turned up. Now I’m vaping at around 70 watts to 100 watts and I feel like such a grown up vaper now. Check me out! I’m a big kid! It doesn’t matter whether you’re up high or down low, this liquid vapes really smoothly. In fact, they all do. And I really like the taste of this one too. I think it’s much more true-to-taste than the Hazelnut Cookie one, and … *Spoiler Alert* I think the same can be said for the rest of the range. You can most definitely taste the maple syrup with this one, and it’s a bit nutty for sure too. Although you can smell the strawberry, I don’t think you can taste it. Perhaps it’s just added for the sweet-factor? The one thing that I most definitely love about Sugar Pie Vapes is that they always provide plenty of vapour. They all provide oodles of the stuff, especially at the 70 to 100 watts I’ve been vaping at lately. They’re only 70/30’s, but I think they produce much more vapour than some of the 80/20’s I’ve got. I really like the way the individual flavours have been used to create this juice, and it’s one that I think I’ll remember for a long time … for all the right reasons. And not just because it reminds me of my two years in Canada either. Would I buy Sugar Pie Vapes Maple Nut Brittle again? Yes. I was sent 2 x 10 ml bottles of the stuff to review, and I’ve obliterated them both. This flavour is deliciously delightful. It’s the perfect thing for that mid-afternoon sweet craving! Would I recommend Sugar Pie Vapes Maple Nut Brittle to you? A hundred times over, yes. Honestly, give it a shot. I don’t think you’ll be disappointed with it. HONESTY POLICY: These Sugar Pie Vapes eliquids were sent to me by TABLites. I did not pay for these products. I was not paid for my review, and I will not be paid for my review. All opinions are mine and in no way influenced by the brand / manufacturer.